This travelogue is built in five posts — an introduction page, three posts covering different regions of the city, and a photo gallery of impressive Viennese architecture. Use the links below to navigate to the different posts. When I thought about my trip to Vienna, two words came to mind — “Eye Candy”. Vienna is simply the prettiest big city I’ve ever seen. It’s buildings and structures and absolutely gorgeous inside and out. It’s layout is very open, with wide streets and many parks that invite hundreds upon thousands of visitors daily. And I found it to be exceptionally clean and well-maintained — not just the obvious tourist attractions that get more than their share of attention, but the many blocks and streets well off the beaten path. Vienna is perhaps not as well known to Americans because it is much further away, virtually surrounded by the former Warsaw Pact nations Czech Republic, Slovakia, and Hungary. And American history is perhaps more heavily influenced by three other former European empires — British, French, and German. However, Vienna was one of the great European cultural sites, berthing numerous famous artists and composers whose works many of us recognize even today. And although it served as a key battleground during many medieval wars, it was comparatively untouched by the two World Wars, allowing it a head start as Europe rebuilt itself since 1945. Whereas most European cities have their token attractions, Vienna is a virtual playground of sight and sound covered whole square miles. Live concerts go year-round, museums are everywhere, all housed in some of the most fantastic architecture you will ever see — each building facade has something unique about it, either with the colorful decorations of flowers or the gracious addition of sculpted columns and gables. 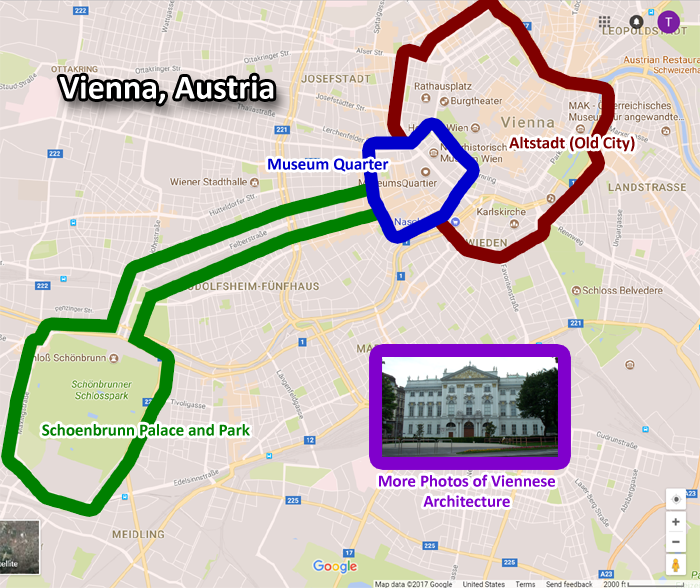 One travelogue simply did not do for Vienna. So, I broke this one up into four posts, including this introduction and three others divided graphically around the city. In addition, I have added an extra photo gallery below, mostly pictures of beautiful buildings and other architectural niceties that I thought you might enjoy. Please click on any of the marked regions in the interactive map below! The map is a screen capture from Google Maps, (C) 2017 Google, with annotations done by me in Adobe Photoshop. Use the links below to access the individual posts.